A documentary called Ai Pioppi, released by Fabrica, directed (and scored) by Coleman Guyon, and written by Luiz Romero, documents the incredible story of Bruno, an Italian restauranteur who, in his spare time, is hand-building an entire amusement park in the woods. 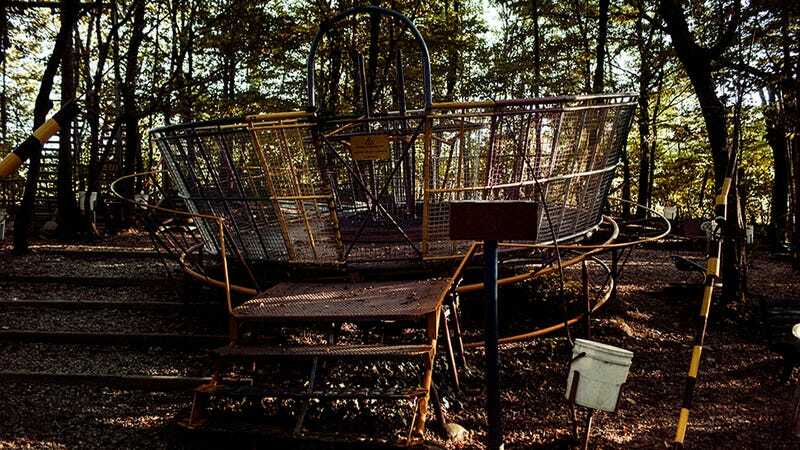 "Hidden among the trees of an Italian forest," Romero explains, "Bruno has been building swings, slides, seesaws, gyroscopes and roller-coasters for the last forty years. They are his passion and a way to attract clients to Ai Pioppi, the restaurant he runs with his family. Throughout this short documentary, his hand-powered toys move alongside his thoughts about existence and death; and why he spent more than half of his life creating rides." The film, embedded above, shows the ambitious scale of the project, not to mention its other-worldly character, as families riding hand-built roller coasters soar through the canopies of trees, Ferris wheels turn slowly amongst branches and leaves, and rides spin like hard-to-believe dreams in forest clearings barely large enough to offer safe rotation. The film stills seen here also capture some of the strange magic of the place, with reflective slides cutting silver lines in the midst of thickets and Bruno himself welding parts for future rides. Many more photos of the park can be seen on Flickr. All images courtesy of Laia Abril and Fabrica.